The four-lane, Pattullo Bridge (named after a British Columbia premier) is a heavily travelled through arch bridge over the Fraser River southeast of Vancouver. It's similar to the Grand Island Bridges on the Niagara River: a truss bridge that changes to a suspended-deck arch over the shipping channel. 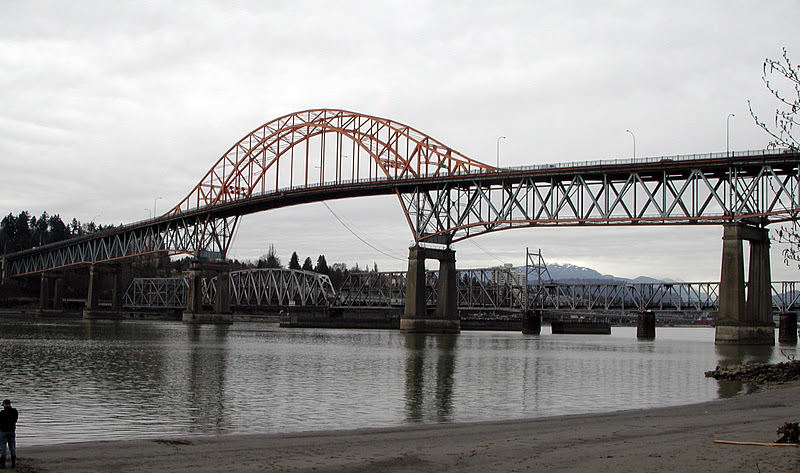 However, instead of being supported by concrete caissons, the Pattullo Bridge is supported on two-column bents. It was built in 1937, has a number of problems, and is expected to be replaced in a few years. Its narrow lanes, lack of a median barrier, and large daily traffic (80,000 vehicles) has contributed to a number of head-on collisions. It was closed due to arson in January, but was reopened a week later by reusing some bridge falsework (Buckland and Taylor found a steel-concrete composite structure in a construction yard) to fill the 60 ft (18 m) gap. These old truss arch bridges will most likely disappear from the landscape in another 20 years. Arch Bridges: Pattullo Bridge by Mark Yashinsky is licensed under a Creative Commons Attribution 3.0 United States License.